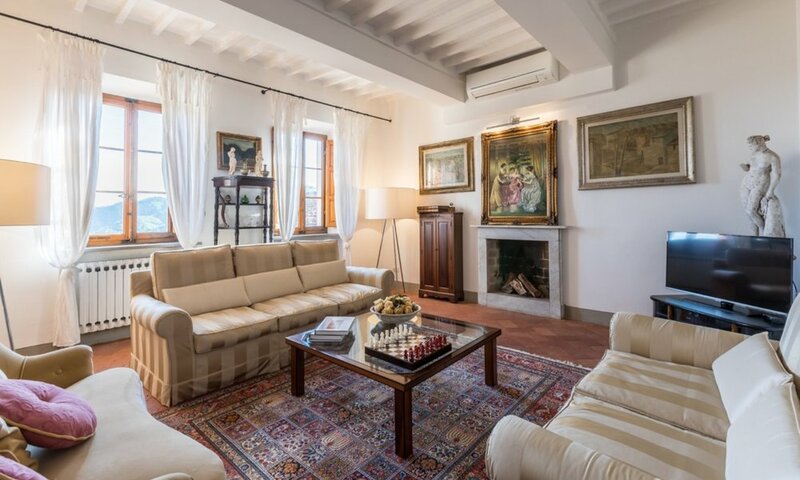 With an enviable position between Lucca and Florence, this rustic, countryside villa is the epitome of 'Tuscanity': wooden beams, cotto floor tiles, wide space, comfortable atmosphere, fireplaces and sights that will leave guests breathless. Choose this property if, for instance, your group is composed by two families travelling together, as one sofa bed adds two extra spaces for children and five bedrooms with bathrooms offer all the necessary space. The managers, a couple composed by an Italian gentleman and one Australian lady, have created a perfect spot, with all the necessary amenities, including a magnificent piano. In the land of Leonardo da Vinci, the famous wine and oil producing territory of Montalbano, minutes from the natural springs and the most famous natural SPA and Grotto of Europe - Grotta Giusti and the medical complex of Montecatini Terme – we find this refined property, situated in the heart of Tuscany. The villa is surrounded by a charming park with swimming pool, with olive trees, cultivated terraces according to the Tuscan tradition and vineyards which frame to a picture. The strategic location and the wealth of the surroundings make this an ideal destination for those who want to spend relaxing and funny holiday, of rich and varied Tuscany culture and luxury. This territory offers an unlimited number of small towns and hamlets to travellers, all with their restaurants, cafes and bread shops, starting from five minutes away from the property. Being equidistant from Florence and Lucca, this villa is perfect for families travelling together or group of friends who are into food and wine itineraries in Tuscany. There is a private pool and expansive gardens for hot summer afternoons. Each area features its own temperature control. On the oak shaded terrace or in the pleasant dining room that opens to the garden guests can enjoy traditional Tuscan cuisine or engage in cooking classes featuring some famous Tuscan mammas and chefs. The Park of Pinocchio is twenty minutes away, beach clubs of northern Tuscan Riviera are less than fifty minutes away and all around lie pedestrian villages (Montecatini Alto being the best one) where parents can eat, relax and watch their little ones run with local kids and no fear of cars. We select the best rental, safe, beautiful properties in the market and match them with the best agents, those who care deeply for their clients and want them to experience an extra ordinary, flawless time during their stay in the villa. We remain available 24/7 and manage a group of extraordinary chefs, cooking mammas, butlers, hosts and runners. If you are interested in representing this property, please do get in contact today with our marketing director.